I went to see Norma at the Met on Thursday in part because, I confess, I had never seen Norma. This was not due to lack of opportunity but rather because I kept hearing about how Diva X couldn’t sing the title role to save her life and was committing a crime against the memory of Maria Callas/Claudia Muzio/Giuditta Pasta, because we all remember exactly what Pasta sounded like. Honestly, I should have just gone, because I have never quite understood why Norma is supposed to be so special. From my admittedly fairly superficial knowledge of the piece, the role’s demands don’t seem radically different from those of some other formidable bel canto heroines—La sonnambula or Lucrezia Borgia for example—whose operas are not given such status. I wonder if, in part, it is because we need some role to serve as a summit of achievement. (Personally, I can appreciate Bellini’s way with a melody but I think Lucrezia is way more fun.) Does this have to do with twentieth-century performance history more than it does with the music? But I digress. Anyway, I finally ended up seeing it at the Met on Thursday. 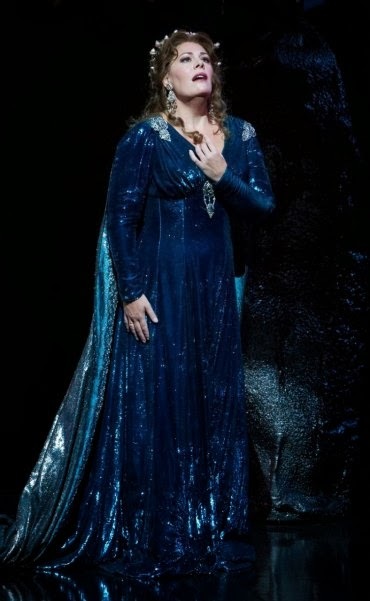 Sondra Radvanovsky made an impressive stab at Norma, but she’s not quite there yet. Sometimes everything fell into place and it was great, and sometimes it was a work in progress. She’s got a very big voice with a highly distinctive color, a reedy dark quality with a fast and wide vibrato. At her best moments, she sang with urgency and conviction fitting the character, but sometimes the technical demands of the singing seemed to occupy her full attention and the drama and music slipped away. The opening of “Casta diva” was really lovely; she can sing the long phrases with real intent, but the vocalises at the ending seemed to lack any purpose. Technically, she can manage it, though a few high pianissimos were tenuous and the coloratura of the cabalettas was at times too careful to have any drive. Of course the circumstances of this performance were against her, and there might be a different explanation for her unevenness. Riccardo Frizza’s conducting was sympathetic, but neither production nor supporting cast was any help. John Copley’s production mixes ancient stones and smooth modern curves with all the individual character of an investment bank lobby. The costumes are sparkly and jingly (Radvanovsky looked great in Ballo last season, but everything is horribly unflattering here), and the choral direction is non-existent. Nor does the staging seem to give the cast anything substantive to work with, character-wise. Let’s not talk about this production any more. As for the other singers, Aleksandrs Antonenko as Pollione has a powerful, dark voice and is rather exciting in his upper register. But this music exposed a shortage of finesse and variation in color that is less evident in more verismic repertoire. Kate Aldrich as Adalgisa did not have a good evening, sounding badly stretched and strained by the size of the house. She was thoroughly drowned out in her duets with Radvanovsky. I heard her sing a moderately-sized but enjoyable Carmen at the Met a few years ago and kind of wonder what happened. Similarly, I was saddened to see that the wobbly and undersized bass singing Oroveso was James Morris; this is not a happy way to end a distinguished career. If you’re someone who believes Norma should only be put on as a special event, this performance will not satisfy you. But Radvanovsky is worth seeing, if you don’t mind the afterthought quality of the rest of it. Note that some later performances will feature Angela Meade as Norma and the fantastic Jamie Barton as Adalgisa. "Honestly, I should have just gone, because I have never quite understood why _Norma_ is supposed to be so special." Perhaps it has something to do with the well-known fact that _Norma_ is the only bel canto opera about which Wagner had anything good to say. 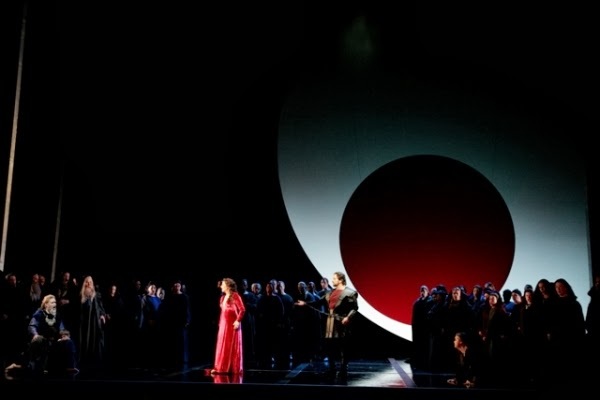 Because Wagner having good things to say did so much for the modern reception of Iphigénie en Aulide? There is a class of roles, cabalistically referred to as the "Assoluta roles", which are considered the most technically demanding (and therefore least often well sung) in the repertoire. Norma is one, and is singled out probably because the libretto is better than the others. The other eight are Médée (Cherubini), Armida (Rossini), Reiza in Oberon, Anna Bolena, Gemma di Vergy, Elizabeth in Roberto Devereux, Abigaille in Nabucco and Lady Macbeth. There's a whole nerdy book on the subject, and I do tend to agree with the opinions espoused therein (though not quite all!). It's called the "Assoluta Voice in Opera 1797-1847", written by Geoffrey S Riggs – a preview is available on Google books. As well as a dissection of each role and its recorded legacy, it's got a lot of discussion as to why these roles make the list and not others, and also discusses why there was this rise of ultra demanding roles at all. Coloratura singers are quite common; what seems to me to be really rare is singers capable of the most agile fioritura who also posess a really dense, dark, chest register to support the line equally below the stave. Even Caballé and Sutherland didn't have the latter, though of the two only Caballé had a stab at more than Norma from the above list. La Sonnambula doesn't make the list because it doesn't really require a dense chest register to do justice, and nor is the coloratura that heavy. Lucrezia Borgia is interesting as it is almost considered an assoluta role by all the measures prescribed in the book, except that the coloratura is not "heroic" coloratura, where the singer has to fight heavy orchestrations. Still, it's remarked that it's one of the, if not the most challenging non assoluta role! I picked La sonnambula deliberately, because it was premiered by Pasta the same year she premiered Norma. So while I can understand the categorizations, I have to wonder to what degree these distinctions are artificial.